We'll be back later today to let you know who won! Our shipping department got their heads together and chose the giveaway for this week. When Danelle came into my office and presented me with their choices all wrapped up in a pretty organza bag, I almost slipped it into my purse, never to be seen again. But I didn't. But see why I wanted to! Tell 'em about it, Danelle! "You guys keep us so busy in shipping! You wouldn’t believe all the international orders too!!!! SOOOO MANY!!!! Sometimes I wish I could squeeze into the box and ship myself to some of these great places…but if I did that, it would leave Jenn all by herself to ship out all of your orders. (A good vacation for me, but not very nice for Jenn.)" "My favorite thing to do as I pull the orders is to imagine what I would make with the items you've picked. It’s fun and challenging, and forces me to look at products I might not normally gravitate towards. It’s a good exercise especially when I have a case of “jewelers” block. Kinda like when you go shopping and try on all these crazy outfits just for funsies and then KABOOM, Like WHOA!!!! You find one that works for you!" "We put this package together to break you out of your "jeweler's block." This is mixture of some of our favorites. Use the nuts and bolts to connect metals without having to solder. Gold, Silver or Copper blanks? Make it your “crazy outfit” and try mixing metals. Silver blanks punched and connected using gold bolts and washers creates great dimension. Stamp, oxidize, or keep it shiny and polished. Whatever you choose, try the opposite of what you normally would do. You might surprise yourself and find your new look." "And to all our International customers…don’t worry, we don’t have a box that I can fit in………..yet!" Add your comment below to enter a chance to win this great package. If you'd like, you can share what helps you overcome your "jeweler's block." To earn extra chances of winning this great prize, post a link to this blog post (not just the blog) on your blog, Facebook page, or your Twitter feed (use #Beaducation in your Twitter post so we will see it) about this National Craft Month giveaway. Good luck everyone! We'll pick the winner by random drawing on Monday, March 28, 8 AM PST. What a great collection, gals! I love mixed metals all together. Here's hoping for a win ... and then hammering away. Thanks! Wow, what a great prize package! I'd love to win--but I'm a happy winner of the free class, and I'm loading up my shopping cart with riveting supplies! When I get in a creative rut I look through my HUGE stack of books and magazines, or online sites like Beaducation. Lots of cool things to learn with! I would love to have this package to increase my skills! I just love this cute package of goodies! Hoping for a win so I can get creative. How fun! This would give me a lot of new things to play with - definitely outside of my "normal" range of ideas. When I'm stuck I like to browse Etsy or even Google - just to see what others are making. It's so fun to see what others are doing differently than I am, especially when it's completely different than my particular niche. some great goodies for cold connections there. I can see so many possibilities. Oh my goodness! The amount of fun I would have playing with that set... Oh, the possibilities! Would love to win!! I usually browse online if I need ideas of what to make. Right now I have more ideas than funds for the materials though. lol. Love.this.package. I have my fingers crossed! When I have writer's block, I'll search etsy to see what others are up to. I also will search quote sites online to get some inspiration. Just posted the blog contest link on my fb account! Thanks! pick me pick me!!! :) I am just getting started stamping and would LOVE to try the "crazy outfit". just tweeted about the contest!! You guys always know what I want! What a perfect bag of goodies!! I've had jewelers block lately and this would really help me get out of it! LOVE it! can't wait to win and receive it! thank u Jesus! What a great selection of goodies to use! Would love to win it all. what an inspiring batch of goodies! Posted this wonderful giveaway on my facebook page. Fun and creative package of shiny pieces -- I'd enjoy playing with all of it. Mix it all together for a shabby chic bracelet and necklace. I have much to learn -- riveting, refresh techniques of soldering and work out of my comfort zone. When I have a creativity I practice my metal stamping techniques and over-stamp on shapes to create a joyful mess and soon I'm creating new ideas. To overcome jeweler's block, I usually talk to my friends, family and fellow jewelers or crafters. Getting a fresh perspective really helps me out. Love this free gift package!! Oh, the hours I could waste away...!! I love the selection and would love to win this group of items that I do not currently have! would group much of them together for a eclectic or 'steampunk" look! WOW ! I just started stamping and love it... I would have so much fun with this wonderful collection ! Divine giveaway. You ladies in shipping know how to rock it! Wandering in a bead store(touching everything, of course) or through bead books, magazines or blogs usually helps get the creative ideas flowing again. Great selection of goodies. These items should get anyone out of a slump. P.S. I also posted on Twitter. What a fun combination of goodies! Makes me want to make something! Hope I win! And I posted your link on my Facebook page! Always can use extra luck! THANKS! I just broke my hole-punch pliers and need a new pair! That package of goodies would be put to good use in my studio! What a great package of goodies! I would love to win! Oooh, mixed metals! I love it! If I have "jeweler's block" I put away whatever I'm stuck on and switch to some small, finishable project -- like maybe earrings. Playing with simple ingredients like headpins, drops, crystals and natural stones often clears up the problem. That's a great giveaway! Often when I go purchase supplies (like beads), I'll take a family member or friend and have them pick out things that they like. It helps me to try out new colors, media, etc. and it helps to get out of that creative block! Here's hoping I win! I would REALLY love to win this! I love using mixed metals and I am really in a funk with our Michigan weather (expecting snow and ice tonight). This would be just what the doctor ordered to brighten my mood and get me thinking SPRING and new, fresh ideas. Shared this blog entry over on Facebook! I hope this link works. I posted a link from my Facebook fan page (jewelry making page). Linked to you over on Twitter as well! Also posted to my main Facebook page. For my usual inspiration . . . I look to the outdoors. But in this gloomy, muddy, cold weather . . . . not much inspiration happening. Great mix of such cool components!! When in a rut, I just back off for a while....eventually things come together. Buying new supplies gets me out of my rut! Buying a new outfit that requires a new piece of jewellry also helps and gives me inspiration, plus then i get a new outffit too! Oh the mastercard comes in handy.... but with this win i wouldnt have to break the bank! Lol! thanks! Would LOVE to win this one! Jewelers Block is not fun - magazines, nature, new outfit can inspire me - but mainly just having time to "touch & feel" my beads and such does the trick!!! Most of the time when I get into a rut, I look through all of the pictures of pieces that I have already made and think 'how can i twist this up to make it something new?' I browse through my BeadStyle and ArtJewelry magazines for added inspiration. Wow, you've picked everything I've had my eye on lately! But who's kidding, I pretty much want everything in your shop. Thanks so much for your generosity this month! Great selection! One thing I do when I'm having "jeweler's block" is pull out beads and findings that I haven't used in a while...normally at the bottom of a stack somewhere! And also going through old beading and jewelry magazines...I have some going back to 2006 that I just found...the ideas in there are still great! I'll leave a comment here and post to Facebook and Twitter, then congratulate another someone else for winning. :) Looks like a great package. Will you offer for sale after the drawing? I would LOVE to win this box of goodies. I recently broke out my riveting tool and started layering all of thos wonderful blanks together, so I need some more please. lol I get inspiration from Beaducation's Tips and Design Ideas. I also look at all the stores on Etsy.com and get inspired by others. Beading magazines are great too. Oh Yes please... and Danielle you are welcome to hop in my parcel... I am in Australia...hehe..
What a cool prize pack! So when I get "creatively stuck", I jump around on my trampoline and that really gets my creative juices flowing. I bounce off and get back to work with some fresh new ideas! I am anxiously awaiting my order! I am new to this site. Can't believe what I have been missing! Please pick me! I would so slip that in my purse too! Just received my first order from you guys and I can hardly wait to get started. Lots of inspiration which is what I like to see. Hopefully someday, I can provide some to others! What a great giveaway. Some of those things would be great with the 2 classes I've taken from ya'll. I've finally gotten almost everything together to actually make something for both classes, but this giveaway would just add more pizazz to my class. Love it. Wow! What a wonderful package! I could get over a block with so many new pieces to play with! What an awesome collection. Am really loving mixed metals at the moment. I love it when others pick out pieces for you then you have to work with it. Love the mix of metals.....When I'm stuck for ideas I look to my surroundings, especially nature. Just posted to my facebook profile page. So much fun in a little package!!!!! ...and I tweeted a link too! Wow! How cool is that!?!?! This set alone gives me all kinds of cool ideas!! i would love to win it. When I get jewelers block I go for a hike and find patterns and ideas from all around me. How exciting! I would love to win this weeks giveaway. I would love to start riveting and this would be a great way to start. I find when I get into a rut I take into account the comments I've recieved from gifts I given or customers special requests. I look at what they were and how I can try to make my creations even better. Haviang the Beaducation "Design Ideas" is so helpful. I can put my own spin on things! Thank you for the opportunity to enter!!!! Challenges and contests can also be inspiring as they usually have a theme and a deadline, which gives me focus. Deadlines can be motivating as I can't keep procrastinating, I have to pick up my tools and beads -- and that's usually the big hurdle for me when I'm in a block. What a wonderful collection! When I get a a making slump, I usually re-organize my beads and that gets the creative juices flowing! A great give away, thanks. What a great giveaway! Will post to my FB & Twitter. I just love your website , I have created some unique pieces with your product. I am always inspired by all of your artists. Love your videos, they are truly informative you make the process so much easier. I love the prize package you put together, I am inspired already. Thank you for an awesome website and for always sharing your ideas and creativeness. How fun is this prize package! I was just thinking that I needed a metal punch. Fingers crossed! When I'm suffering from a block I look through art books, fabric swatches, and walk through the hardware store. I am sure looking forward to the possibilities!! OK, when I get a creative block, I love to look at my books and magazines of jewelry projects. Or alternatively, I open up the drawers in my stash of beads and stones. Fondling my gemstones often gives me great ideas for something gorgeous! Can't wait to get creative when I'm chosen as the winner of these fun blanks and tools! Woo hoo!! LOL! Kinda like when you go shopping and try on all these crazy outfits just for funsies and then KABOOM, Like WHOA!!!! You find one that works for you!" What an awesome collection. Thanks for the chance to win ladies! What an incredible give away...please count me in. I would have so much fun with this collection of great components! I try to have more then one project on the go at once so if I get stuck on one I move on to the next for a while. WOW. Metal working components, just what I need for my next step in jewelry making! So my husband is tired of making holes for me!! This set is perfect for some new spring creations. My 3 little girls inspire mommy to experiment with my creativity! That collection screams STREAMPUNK all over it!! Love it! Fun goodies! Stamping (and Beaducation) rocks! oh they are all so pretty. i am just getting started with all this and it has been a bit over whelming for me with all the different stuff. would love to win this. Goodies! Love 'em. If I'm not sure what I want to create, I look through my jewelry table and go through my beads. Just refreshing myself with what I've got and coming up with new combinations. I shared a link on my facebook page-a first for me! I want to win this for my mom so that she can continue to make great things. This is a good collection..it's always great to have new inspiration! What a lovely set of goodies, they would definitlye inspire me to create! Have facebooked the giveaway too! Ohhhhh this is a perfect set for someone somewhat new to jewelry making like me! I keep a morgue of ideas and inspiration from magazines, photographs, sketches - when I need a creative jolt I just flip it open and see what I find! Awesome giveaway! I get inspiration from others work and looking at tutorials on Beaducation! How awesome would it be to create with this package of goodies. This would help creative block big time! I love this selection of goodie! I just took a class on cold connections, and this is a great prize for that. Thanks for the giveaway!! Bench block solutions- clean and organize my studio space, go through my sketch book, browse art museum sites, visit jewelers forums, do something else. Metals, nuts & bolts...........what a great combination. I'd love to win but also want you to know I appreciate your free online classes & wish I had time to take more of them. You guys are so helpful in making my creative juices flow. Someday I hope to do a better job with my jewelry making - I know, practice makes perfect. THANK YOU Lisa & everyone at BEADUCATION!! forgot to say I also facebooked it! What a great collection! I would love to layer and try to put together something new for me. I'm still a bit new to stamping, and can't wait to try out riveting too! Love it! I want to start creating stamp jewelry and this collection would be a wonderful start. I love your idea gallery and free online instructional classes. They are such a big help to a "newbie" like me. I just discovered your site and blog today. Perfect timing :-)! What cure's my 'jeweler's block is just pulling out a pretty focal bead, then a bunch of beads in matching or complementary colors until I have a mix that looks good together. That usually gets my mind going, visualizing a finished piece. Then I start in. Usually the finished piece ends up looking nothing like I imagined (lol), but the key is to just get started, and then let things evolve from there. Surfing websites and looking through magazines for inspiration also works for me ... as does organizing (or reorganizing) my bead stash. I discover things I'd forgotten about and that gets the juices flowing. When I have a creativity blank I usually just go hiking....never fails to clear the mind and inspire! perusing blogs, magazines and etsy for ideas usually gets me out of my rut. Just blogged about your great giveaway with a link to the giveaway post and to Beaducation itself in the post. Not sure if I'm too late!! but I would love to have play with all of that!! Oh the things I'd create!!! Posted on my personal Facebook! would love to win one of these! you guys are great! Posted on my Fan Page!! Oh that looks way awesome to win! I can imagine making a cute textured necklace with the heart. 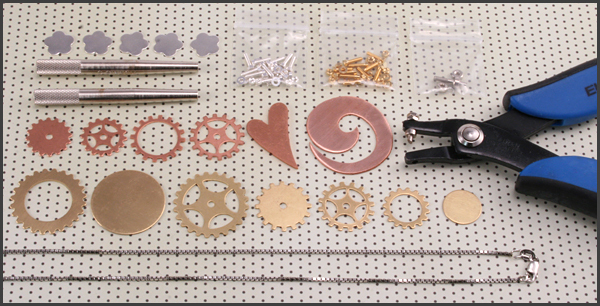 Some cool steam punk designs and learn to rivet with the set.